The inspiration behind the design The inspiration for our project was found in Iceland’s natural beauty, in its bare and serene landscapes, green valleys and glacier-cut fjords. Our quest was to design a project that in addition to providing a sense of destination and purpose, did so with a high degree of respect for the essence of Iceland: nature. Its latitude reminds us of the importance of the sun as a most valuable and rarely accessible resource available in this Nordic land. 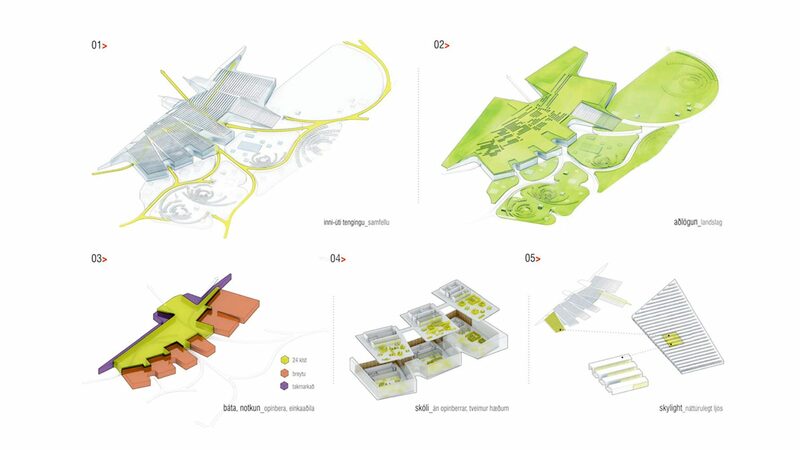 Landscape, sun exposure and a deliberate subordination of architecture to nature constitute the backbone of our project. Planning considerations After reading the competition materials we noticed how the Reykjavik planning department has invested a significant amount of thought and effort on the master plan of the residential areas around the project site, and also on the general master plan of the expansion of Reykjavik. Our analysis of these documents has yielded valuable insight into the character of the site, and over its significance in the greater city. 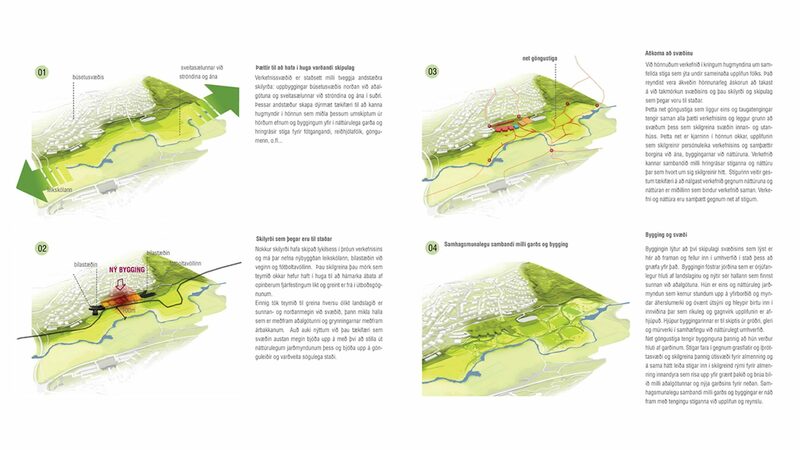 The project site is located between two opposite conditions: the built-up residential area north of the main road, and the bucolic shore and river on the south (Figure A). These opposite poles have provided a valuable opportunity for the exploration of design concepts that mediate the transition from hard surfaces and buildings into natural parks and different circulatory paths for pedestrians, bikers, hikers, etc… Existing physical conditions Several existing conditions have played a key role in the development of our project, such as the recently built Kindergarten building, the completed surface parking lots adjacent to the existing road and the existing soccer field. They define logical boundaries of development that our team has carefully evaluated in order to maximize the effectiveness of prior public investments, as stated in the competition brief. The different topography between the north and the south of the site, with its acute drop of elevation along of the main road and its shallow shores along the river bank, was also considered by our team. Likewise, we took advantage of the opportunities presented by the eastern areas of the site by displaying its natural formations, offering avenues of trekking and preserving areas of historic significance. Site approach We have designed a project around the idea of a network of continuous pathways which provide a unifying user experience. 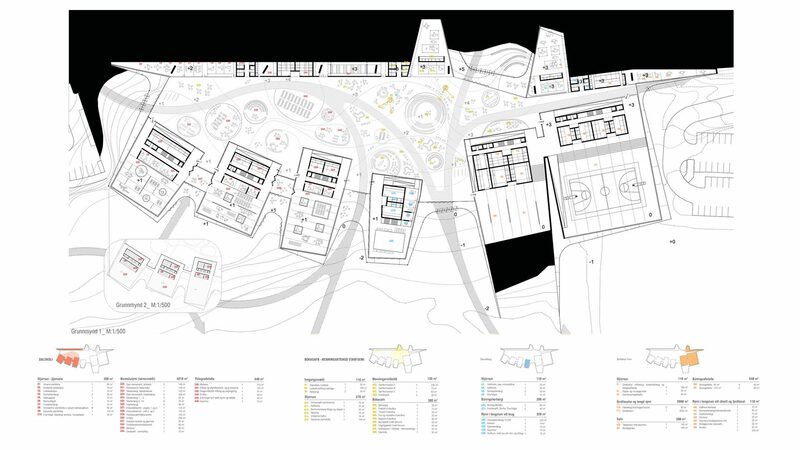 The limited ratio of program to site area and the varying existing physical conditions and planning conditions of the site proved to be a significant design challenge. 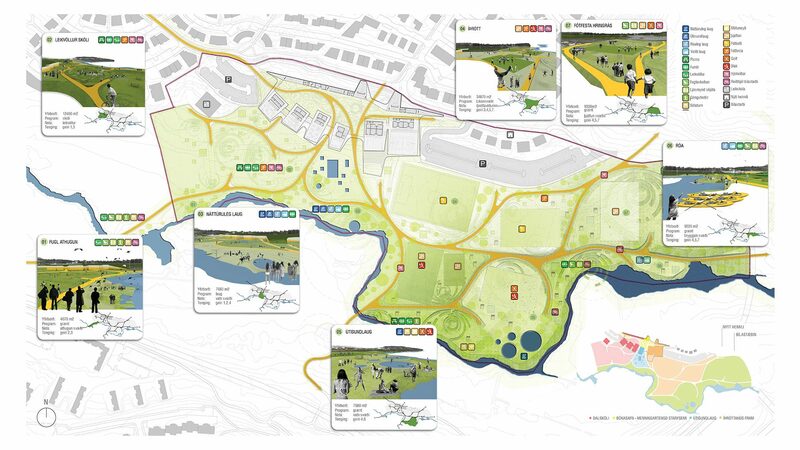 This network of pedestrian paths, like neural connections, link all the components of the project to each other creating a series of program sectors (Figure B) which help define both outdoor and indoor program areas. 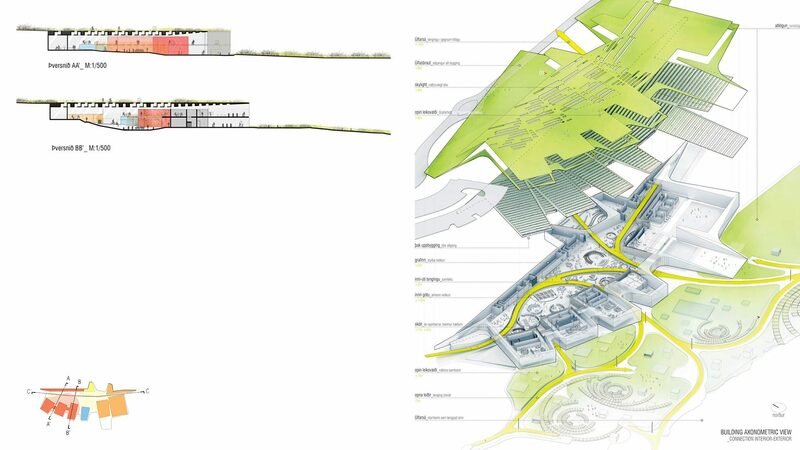 This network of connectivity is the essence of our design, the single experience that defines the personality of the project stitching together the surrounding city with the river, the built environment with the natural surroundings. The project explores the relationship between activity filled circulation path and nature, each defining the other. The path offers the visitor an opportunity to access program through nature, and nature is the medium which binds the program. Program and nature are brought together by a network of pathways.